The 642 is the most durable regulator on the market today. This regulator sets the standard in quality features such as a forged brass body for durability, accurate machining, and a high quality chrome plated finish. This regulator has a built in Co2 resistant solid nylon inlet seal for constant perfect sealing. Comments: Don't cheap out on a regulator. Get A good one like this. No leaks, holds pressure perfectly heavy duty construction. Works great ... just set it and forget it! Knowing c02 volume is very helpful. Comments: The local keg retailer I was buying my kegs from, also handles c02. The c02 refills varied in number of kegs it would dispense. The last straw was on my last refill. I managed to finish two kegs on one refill. The prior fills varied. It's not the money, but I dispise being cheated. I had a polite conersation with owner, he refilled my bottle a reduced rate, and have pushed 10 kegs off of this last bottle. I will probably get 20 more out of this bottle of c02. Bottom line without this regulator, I not be able to monitor my c02. Nice product with a great reputation. Comments: I have no negative issues. Comments: Easy to install, straight forward design. Once your pressure is set just engage the locking nut to prevent other from fiddling with it. The quality of this product is far superior to the one that I just replaced. No more pulsating that once created a foamy product. Lastly, great price! I was shocked to find it on sale. Comments: This is a well made product that is easy to enstall. Comments: Got this one with a home kegerator set up and looks great and works like a champ. No leaking and appears to be very accurate. Adjustability is tight. If you can swing the extra cheese, you wont go wrong with this reg. I probabaly should of gotten the two keg version but I didnt. Comments: I own a single tap kegerator, but unfortunately for me, the factory regulator that came with it was a P.O.S. After looking at various options, I decided to upgrade it with a micromatic premium dual-gauge unit, which I'm very happy with. Two features in particular are worth mention. The first is the large easy to adjust pressure knob ... no more fiddling around with screw drivers. 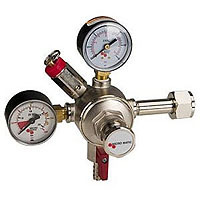 The other is the pressure-relief valve, which allows easy venting and enables faster and more accurate readings when reducing the pressure sento to a keg. As for the secondary gauge ... it's nice, but the only true way to tell how much is in a CO2 tank is to weigh it, so it's only real use is to confirm that you're either empty (or close to it) or not. I recommend combining this regulator with a protective cage, to protect the gauges. Comments: This regulator is awesome. In addition to its attractive design, which would not be out of place if it were visible in a commercial bar, the ability to adjust pressure with a few gentle turns of your hand is priceless. It comes with clear and concise instructions, holds the line where it is set extremely well, and is a fantastic purchase for the begginer, and experienced homebrewer alike. Comments: This is great! As soon as I got it delivered, I went down and set it up. I could not believe how easy it is to use. No tools necessary. Just some simple turns with your fingers and the beer is flowing! The guage is very accurate and dependable. Comments: I used to have a different regulator and I kept getting leaks out of the front of the regulator and you'd have to take it apart and reassemble it whenever it happened and I lost a tank of Co2 5-6 times. I got this one about 9 months ago and haven't had a single issue with it yet and it's a lot easier to adjust because of the hand dial on the front. Don't waste your time or your Co2 with the cheaper ones.